The California of yesterday is being created again in Morongo Valley by a group who believe there should be a living replica of the Golden State’s colorful days of old. Pioneertown, a colorful community built entirely in the atmosphere of the old West is rising in Morongo Valley, situated in the southeastern slopes of the San Bernardino Mountains. Main Street, extending through the heart of Pioneertown, is already improved with a series of business structures characteristic of the early days. 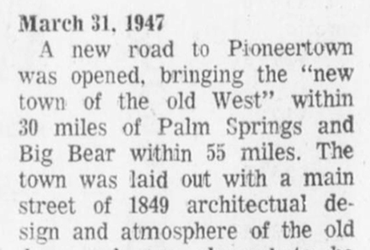 Formed in February, 1947, the Pioneertown Land company placed it’s first subdivision of the unusual new mountain-desert community on the market early in April. In the first six months of the activity the company announced sales of approximately $250,000. Starting with a nucleus of Gordon Brown and Bill Dennis, co-proprietors and J.B. Web sales manager, an organization numbering 20 brokers was soon attracted to the colorful community. 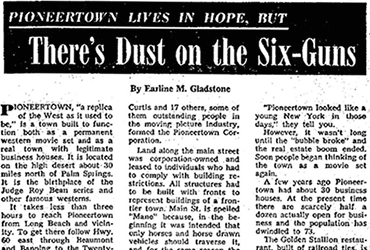 Each month, including me ordinarily don’t summer months, sales of Pioneertown property have increased. No little credit for the results is given to the colorful station wagons utilized by the sales force in traveling between Los Angeles offices at 8501 Sunset boulevard and Pioneertown. To date there are approximately 400 property owners who have taken possession of ranch sites of 1 1/4 acres up. Many of them have built or plan to build homes and ranches in the mountain-desert country embracing over 25,000 acres. 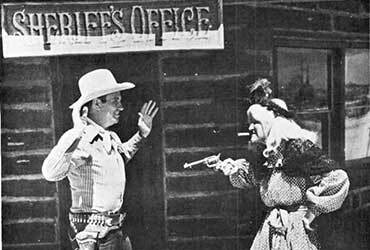 Among these are numerous celebrities of stage and screen including Roy Rogers, Dale Evans, Minna Gumbel, Harry Davenport, Bob Nolan and the Sons of the Pioneers. The altitude of 4000 feet makes Pioneertown and all year-round community, it’s developers state.